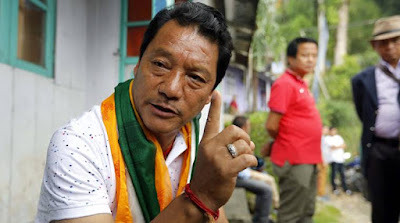 Gurung’s former colleagues — now members of the Binay Tamang faction of GJM — as well as other Gorkha parties such as the GNLF, had on Friday said that the SC decision was the final nail in Gurung’s coffin and that he would be unable to recover and rejoin Darjeeling’s regional politics. While claiming that those left in the Gurung faction are now looking to jump ship, general secretary of GJM’s Tamang faction, Anit Thapa, had pointed out that Gurung and his supporters have lost mass support in the last six months. Referring to the inspector in charge of Darjeeling police station allegedly threatening a GJM supporter, Gurung said the conversation “reflects the politics of violence being played by the government of West Bengal”. “I have not given up and will continue to work for our community. I have not been dishonest… and will never be. I will martyr myself for the cause but I will never deceive my people and community,” he added.